You might be surprised to know that when you put your headphones on and your feet up for some ‘me time,’ some 2.5 million Australians are there with you, listening to audiobooks. However, with a market growth of 30% in ANZ each year and a 50% market growth globally each year, there is clearly a change in traditional perceptions of the audiobook audience. Rebecca Herrmann, founder of Bolinda audio, believes that audiobooks have come in to their own, ‘as the audiobook market grows, audiobooks have become a counterculture to reading.’ Surprisingly, the data shows that the vast majority of audiobook listeners aren’t necessarily readers. ‘The audiobook market is becoming less about people wanting to read and more and more about simply being entertained or learning stuff through the power of the spoken word,’ says Herrmann. Listeners also consider time spent listening to an audiobook as quality downtime and something that they choose to do for themselves at home. At the other end of the scale people are also turning to audiobooks because they allow you to multitask. Audiobooks help you keep up with what is happening in the literary world while going about your day, they are portable and can be listened to anywhere. According to data from the 2018 Audio Publishers Association Annual Report, the top activities while listening include: driving 65%, relaxing before going to sleep 52%, doing housework and chores 45%, commuting on the train 47% and while exercising 30%. Interestingly, the third top reason for listening to audiobooks is because we like to have stories read to us and while we are all aware of the literacy benefits for children in listening to a story, research is only just starting to emerge on the lifelong benefits of listening to stories at any age. 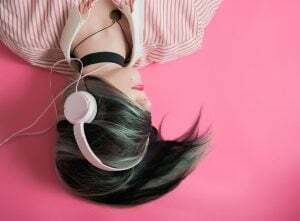 When coupled with other resources such as podcast interviews with authors and reviews, audiobooks can provide an enhanced experience for the reader, however the audiobook is also offering an alternate experience. There are also literacy benefits for children and non-English speaking listeners, with the use of audiobooks improving reading accuracy by 52% and comprehension by 76%. And this increase in listeners means that there are lots of interesting developments in the audiobook space. In the UK, the industry has witnessed the first straight to audiobook title – with no print version first. Thriller author Brian Freeman’s 19th novel is only available as an audiobook and there are other exclusive audiobook deals in the works. With mysteries, thrillers and suspense titles heading up the top three genres that people listen to, it’s not surprising that a thriller is first off the ranks and we can expect to see more exciting innovation.